This photo appeared on line at theledger.com on January 8th. The Kelly Recreation Complex was the venue (outside) for the Florida State and International Senior Games in December 2011 and is a great place to play if you are visiting near the Lakeland, Tampa, Fl area. Check the 'places to play' page on the USAPA website for scheduled play times. 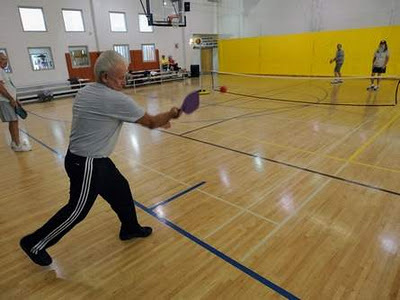 Bob Yuhas serves during a game of pickleball at the Kelly Recreation Center in Lakeland. Kelly Rec is offering singles and doubles versions of pickleball, played on both indoor and outdoor courts.